It's hard to imagine a more beautiful area for golf than the mountains of Western North Carolina. What a great place to enjoy a few rounds of golf at one of the area's many public, resort and private country clubs. But the primary attractions to mountain golf are lush fairways, sprawling bent grass greens, cool breezes and a gently undulating terrain. The lure of the mountains offered a unique design challenge to the dean of American golf course designers, Donald Ross. He designed several courses in Western North Carolina, including the former Asheville Country Club (now the recently renovated Grove Park Inn Resort & Spa course). His goal was to provide a challenge to players of all abilities. No matter where you choose to spend your Carolina Mountain Golf Vacation, you will by impressed with the majestic beauty and special feeling of the mountains. One of our many favorites in the mountains is Etowah Valley Country Club and Lodge, located near Asheville in Hendersonville, North Carolina. This is truly a beautiful setting where the Great Smoky Mountains weave through the Blue Ridge, creating a scenic mountain plateau 2,200 feet high. Etowah's lush fairways are meticulously manicured, and the 27 bent grass greens are as large as 9,000 square feet. Three nine hole courses allow you to play a variety of 18 hole combinations with 4 tee positions. One of the most unique mountain golf experiences is located only minutes from Asheville. Reems Creek Golf Club, designed by Hawtree & Son of Oxford, England offers a Scottish Highlands look with rolling terrain and deep, large knolls that bisect the beautifully manicured bentrgrass tees, fairways and greens. Mt. 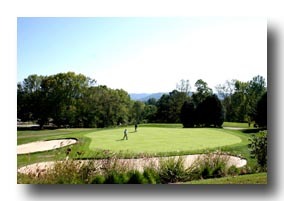 Mitchell Golf Club is another great choice, located one hour from Asheville, just off the Blue Ridge Parkway. Surrounded by the Pisgah National Forest, this is one of the most scenic courses in the Mountains. Golfers have enjoyed Lake Lure Resort and the beautiful Apple Valley and Bald Mountain courses for years, but there's been a name change in this popular resort. The new name and identity is Rumbling Bald Resort on Lake Lure, but the name is not actually new, but old. The name "Rumbling Bald" was an indian name for the area. According to legend, the rumbling of the mountain was used to forecast storms and the often dramatic changes in weather common in mountain areas.